I checked out Bungo after seeing Tweets about Season 2 episodes being aired, and I didn't know that Season 1 had aired earlier this year! Talk about being behind the times. Ok so Bungo. I've only seen Season 1 for now since Season 2 is still being aired (am I cheating? ), and I love it. There are some parts I don't like (we'll get to that), but overall I do love Season 1. Bungo is based on MC Nakajima Atsushi, the first orphan I've seen in anime and from what I can remember, and who has the strangest hairline ever. The poor kid is kicked out of his orphanage from the very beginning, and with no money and nowhere else to go, he decides to live his life on the streets, that is until he meets the very funny and strange Dazai Osamu after saving him from the river. Turns out he was trying to commit suicide, and failed at it. So that's pretty much the start of Bungo. 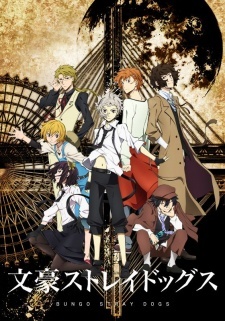 Things progress shortly after Dazai is saved, events occur and Atsushi is then employed at a Detective Agency where people with supernatural abilities work, including a guy who looks and sounds exactly like Hyuuga from Kuroko no Basket. He's kinda got the same personality as Hyuuga and this makes him even more hilarious when he's in scenes with Dazai or Atsushi. And I thought that with this new turn in life Atsushi would have haircut to sort out that hairline, but sadly that's not the case. Anyway, now that Atsushi has a new life to lead, things get pretty interesting. We're introduced to new characters with different abilities and unique traits, some of who can be a bit strange and have backstories depending on their relevance, and plot twists that show up along the way. It makes for a good binge watch series if you're a late starter to it like me, and would make for better suspense if you watched it while each episode aired. The story and characters are great, but the downside to Bungo sadly is the action. Don't get me wrong; there are some brilliant scenes in there, some of which I recorded and tweeted, but it started off really slowly. Basically, if you want the good scenes, they come about halfway into Season 1 when the story takes an interesting turn too. The main scenes I'm not liking are the ones featuring Atsushi; he does have a supernatural ability which I won't mention, but he isn't able to use it properly in the beginning then somehow manages to have mastered it around Episode 6 which just confused me. The other scenes he's in make for better screen time, but how his character took a sudden turn without it being mentioned in the story was something I didn't like along with how Atsushi was pretty much useless at the start of Season 1. So overall Bungo Season 1 is great, but I'm keeping things vague in terms of the story so that you guys can check it out for yourselves. It's definitely a must watch despite the meh action scenes you get in the beginning, but all is pretty much forgiven after like Episode 6. I can't wait to watch Season 2 and compare it to Season 1; this series has a lot of potential and hopefully Season 1 didn't set up such a good ending for it to go to waste in Season 2. Also the characters are such a lovable bunch and they're all so unique which creates a perfect balance of seriousness and comedy. Seriously guys, check it out.